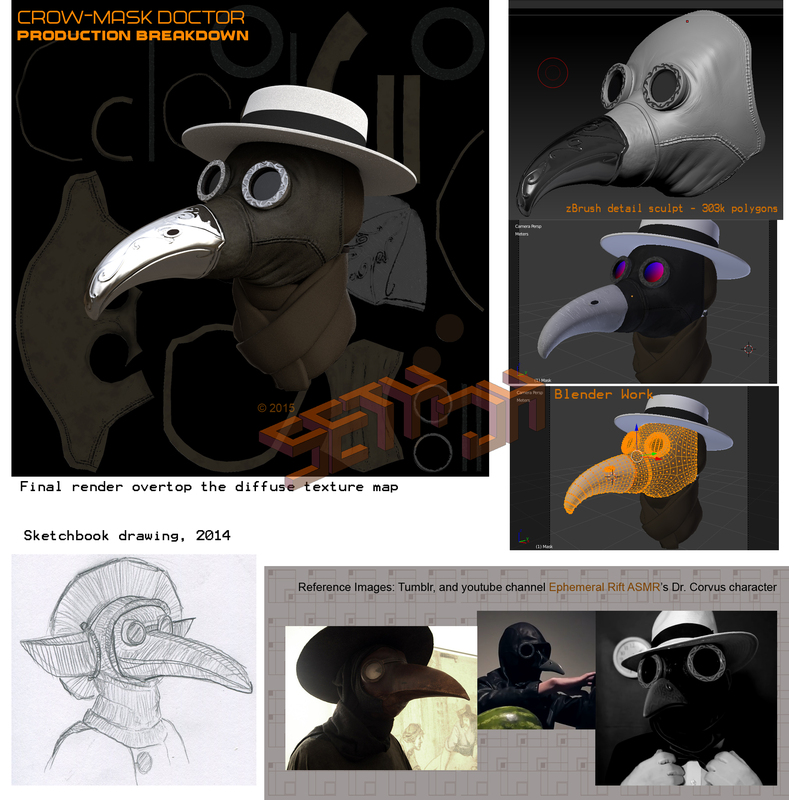 The final renders of my 3D crowmask plague doctor model. My process involved a lot of bouncing back and forth between Blender and zBrush. I did all of the textures in zBrush and dDo and rendered it using Blender Cycles (see my previous post about the crowmask model). 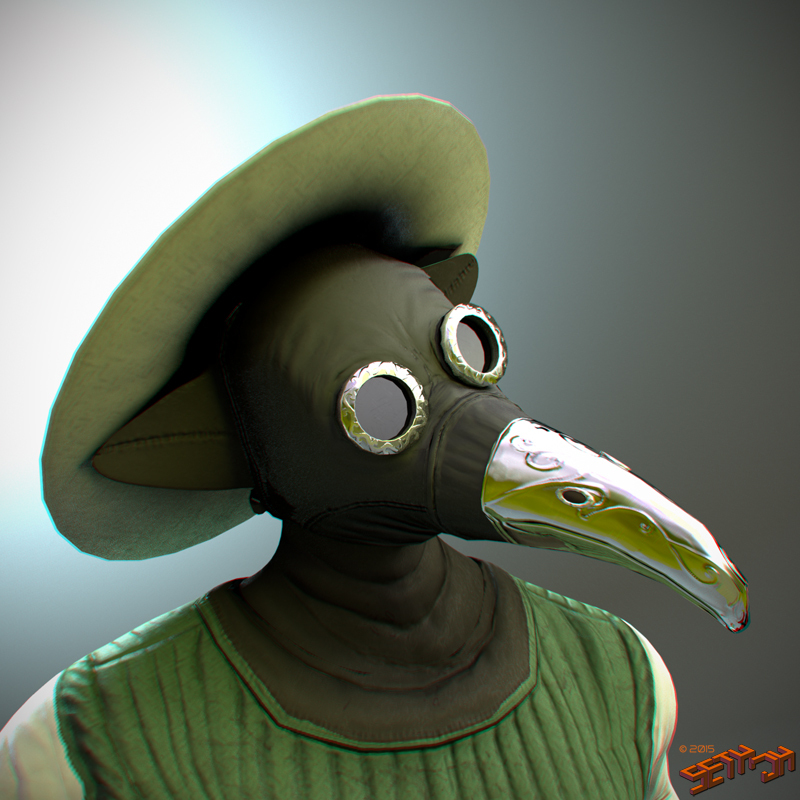 I recently felt inspired to make a crow-mask plague doctor type character. 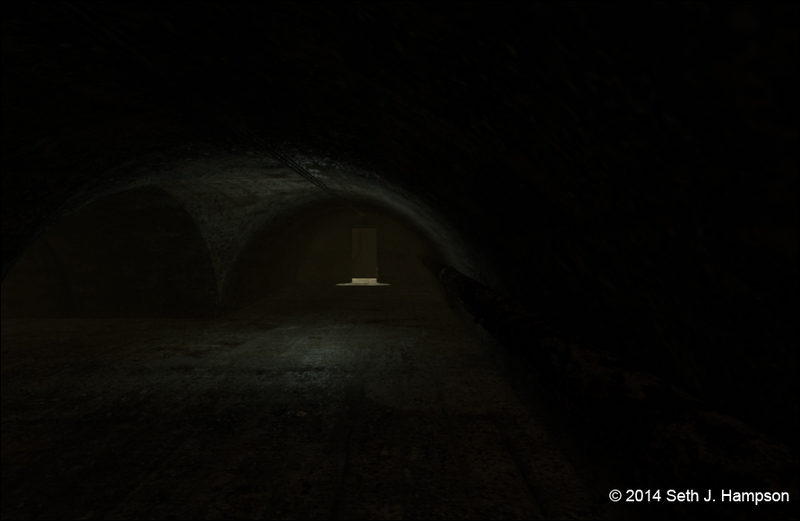 To complete this project, I used blender, photoshop, zBrush, and dDo. Of course, there’s much more work that could be done, but the focus of this project was the mask itself. I wanted to refresh my skills in porting texture from zBrush to Blender. First I collected some of my sketches and references, such as the ASMR (the phenomenon when you hear sounds that make your neck/head tingle) youtube channel Ephemeral Rift and his character “Dr. Corvus”. I loaded up zBrush and sculpted out the shape of the mask. I then took it to blender and cleaned up the resulting geometry because zBrush hardly ever makes geometry that is clean and neat for polygonal modeling techniques. After cleaning it up, I UV unwrapped the model (UV unwrapping is the process of taking all the 3D “faces” and pointing them to a 2D “painting” for colors and textures). I sent it back into zBrush and got the resolution high enough for me to sculpt in the little details like metal embossing, leather wrinkles, and stitching. I used zBrush’s multimap exporter tools to “extract” the detail off the high resolution model to map it to the low resolution final model. 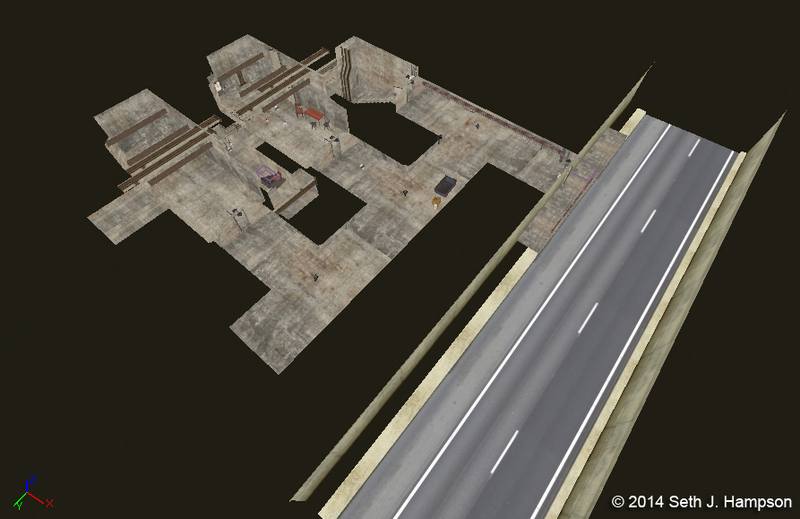 Next, I took my extracted “maps” into a photoshop plugin called dDo (the legacy version is free, if you want it, scroll to the bottom of their page for the download). 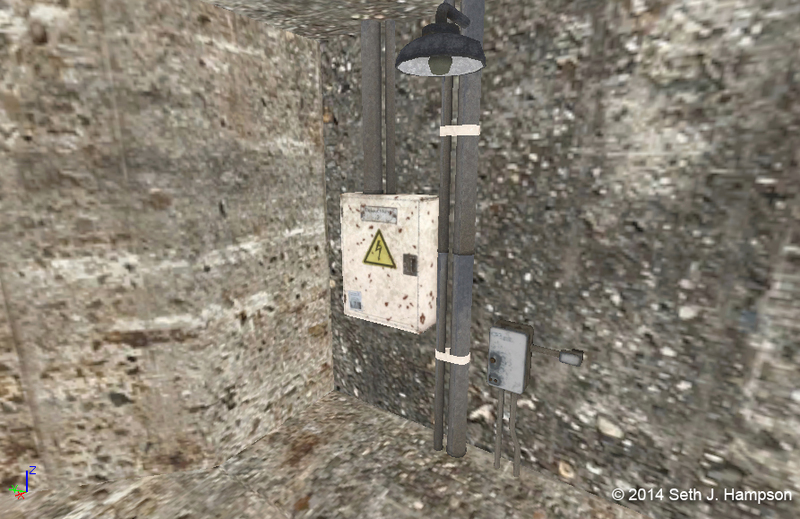 dDo is a collection of filters and preset textures that you can apply procedurally to your model to give it dust, scratches, spots, and other dirtyness. 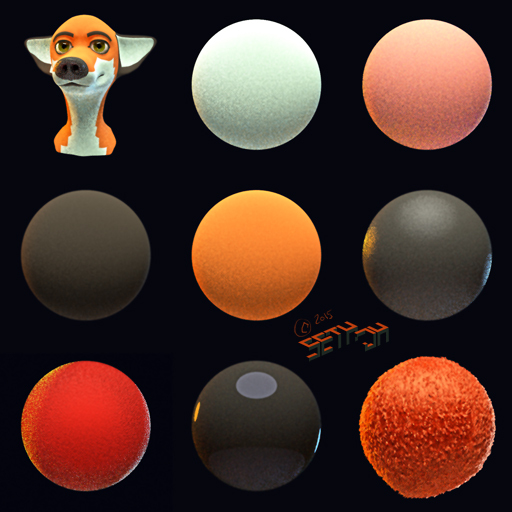 It helps create believable textures without spending as much time (good for studio productions under time constraints). 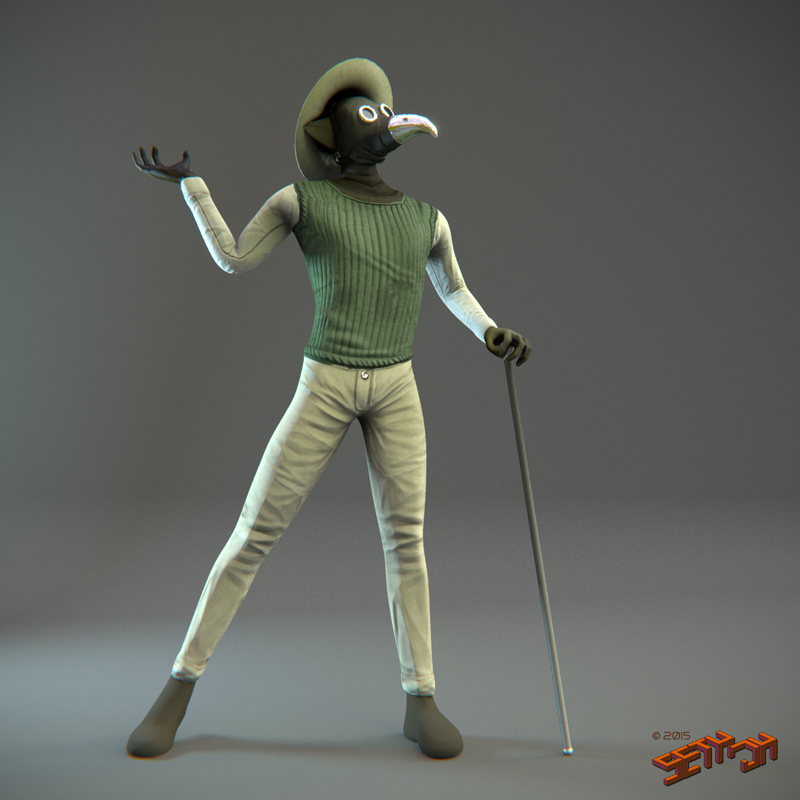 With my finished mask, I roughly modeled up a hat and some clothes to pose for a final render, which you can see above. I used Blender’s cycles rendering engine. I intend to model out an entire character to the same quality as the mask. Yo it’s been a bit. I’ve been busy working on school stuff and while I have been posting things, I seem to have neglected this blog. Let me catch you up (if you still follow me, that is). First and foremost, I changed my logo recently after feedback that it looked “straight out of the ’70s” and “I wonder if this business card is current or if it’s ancient and I should toss it”. I also redesigned my Sachtberg characters, as I am working on redoing an animated storyboard (animatic) for a potential short film. 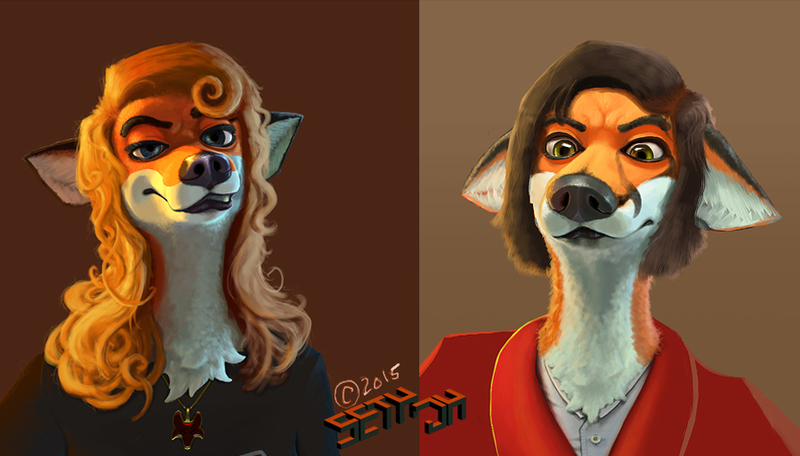 I experimented with a new painting process which involves using a “Digital Maquette”. I use Blender Cycles to make a 3D render of the subject with lighting and materials. I then use this as reference for painting. It’s the same as making a maquette (miniature posed sculpture) out of clay. The results are good, but rendering the maquette takes almost as long to do as it takes to paint the final picture. Here is a sample of one of my render trials for a painting. 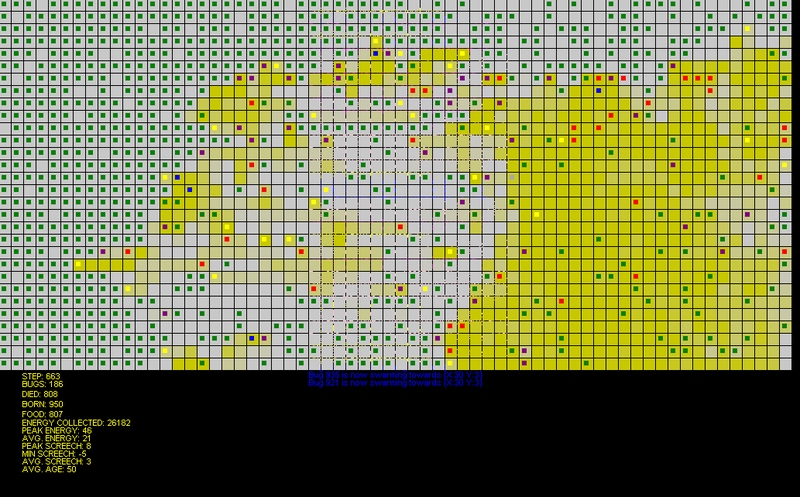 I used spheres to gauge the lighting from all directions as well. Both of these paintings were completed using digital maquettes for perspective, lighting, and material reference. Yes I know it’s obnoxious that I continue to paint these characters but whatever. Read on to find out my thoughts on this subject. 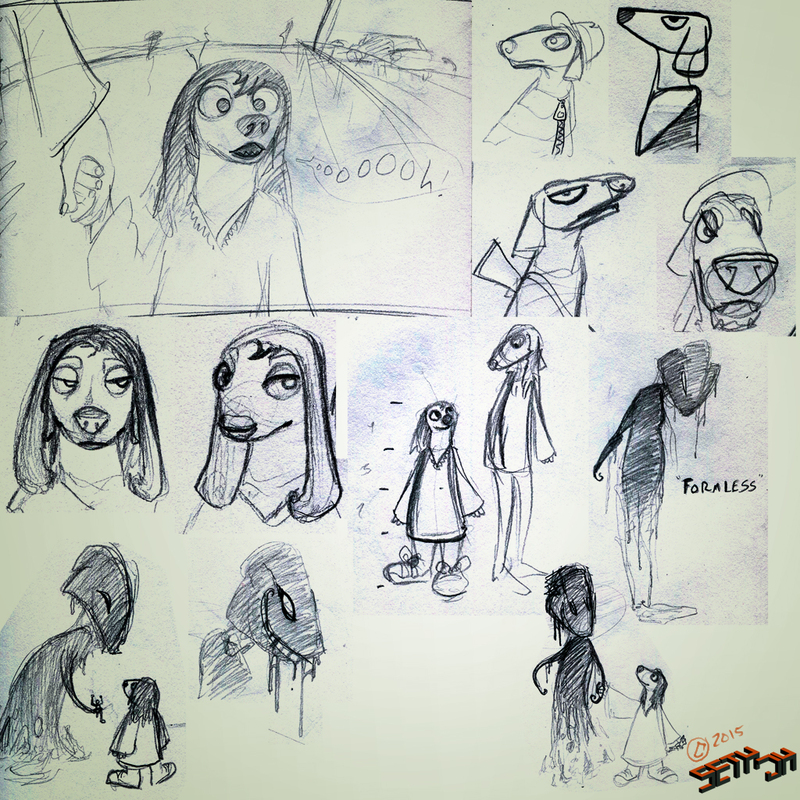 I have made the decision to focus my character design work on creatures, animals, and humanoid animals. Personally I feel more interest in designing such characters as I believe humans are “boring”. Not to say I won’t design human characters any more, but they won’t be my “preferred area of work”. Humans are still artistically “beautiful”, and the human figure is a wonder of nature. However, I find it more entertaining to apply these human characteristics to something non-human, and to invent new species through all kinds of “Genetic combinations” and biological research and what not. My drive as an artist is to create a new world. I apply algorithms and research and extensive effort into new cultures, new histories, new ways of life. Perhaps a mockery of this world, or a reflection of what could be possible out there in the mess of universes. 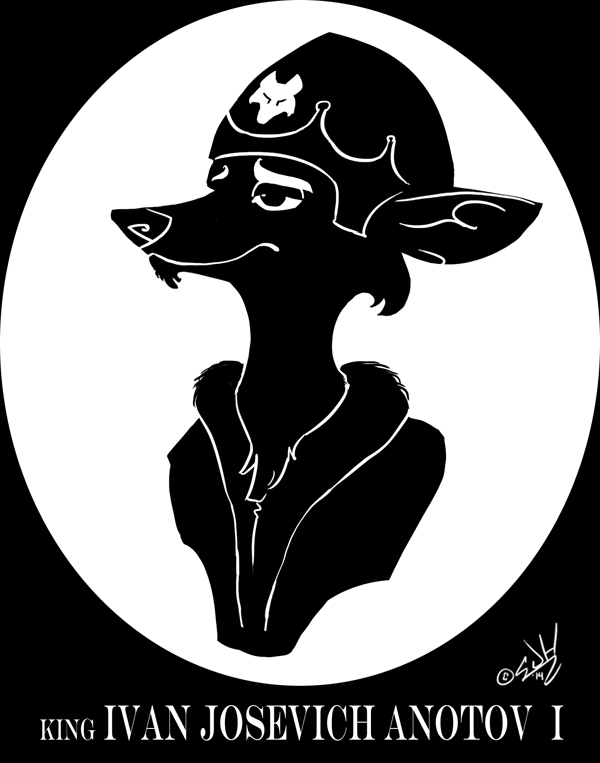 It may be my personal opinion, but I find animal characters fundamentally more interesting to look at- especially if human qualities are cleverly applied. In addition to creating sentient animal-people characters, I also think Artificial Intelligence a fascinating subject rich with designs to explore. FROM GREATNESS TO DUST update: My comic isn’t over, I’m just pulling back and reconsidering my approach to delivering the content. The comic page format looks nice, but it takes a long time to produce. The rule of comics is “show, don’t tell”, and I find this rule disappointing because it makes describing things deeply a challenge. I am aiming for a more “mixed media” approach- including comic formats, novel-like text with illustrations, and even animations. Keep your eyes out for the next release. 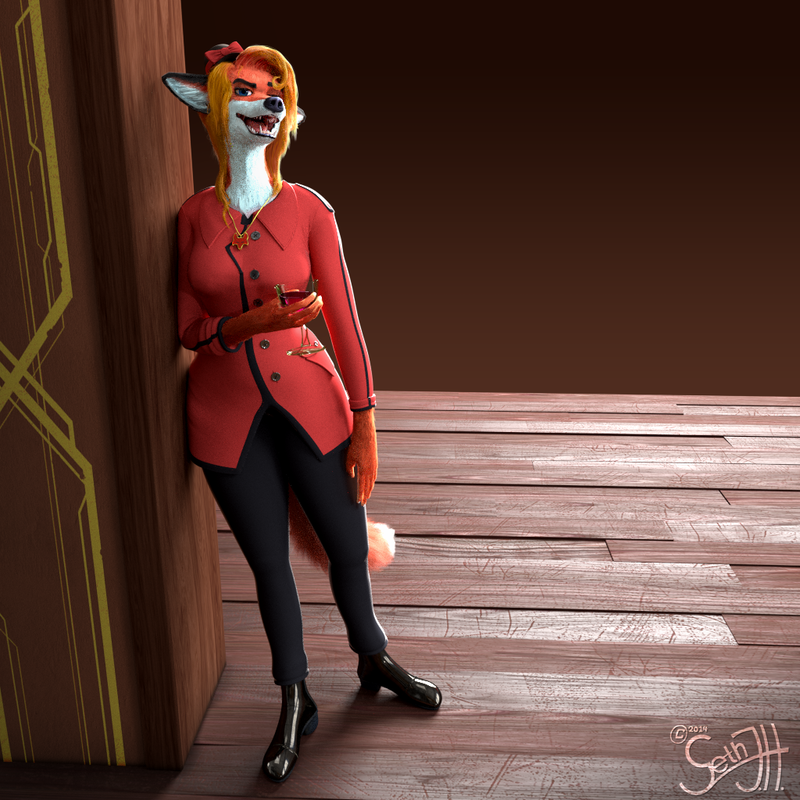 Final Render of Marija K.
I spent way too long on this because of a few reasons: I was figuring out how to use Cycles shaders better, I was limited to slow computers with bad render time, and I had to learn a lot about fur systems in 3D. At least I’m done with it now. 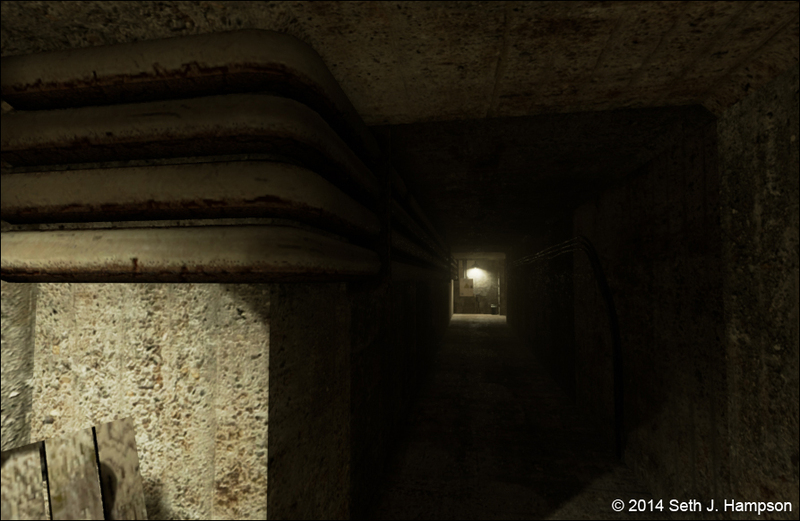 Rendered with Blender’s Cycles engine and cleaned up in Photoshop. My fall semester started last Monday, and it has been a busy week. Here is another workdump covering most of what I’ve done the past month. “Bugs” – A simple artificial life experiment I programmed in C#. My original hypothesis was to determine if individually mindless agents could somehow form a “hive mind” type network that was reactive and adaptive as a single, intelligent agent. It turns out my experiment deviated from my hypothesis, but proved to be an interesting project nonetheless. A population of bugs are dropped in an environment where food is randomly placed over time. The bugs are charged with eating food and not running out of energy. When a bug finds food, it “screeches” to call other bugs to come help eat it. The blue-greenish graph display is a record of the population over time. Bugs would “explode”, eat all the food, reproduce, and then die quickly in a regular cycle. I plan to do more with the Bugs demo later. 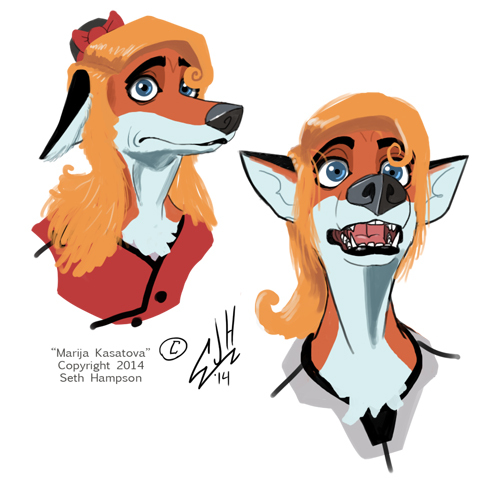 While we’re on the subject, My friend gave me good pointers and helped me vastly improve my Marija character model’s rig. There are still some weird problems to work out (like how her leg is bent oddly), but it is coming along quite well now that I have some guidance. In my 3D character animation / simulation class this semester, our first project was to play with “Norman“, a free example character rig for Maya. Drawing inspiration from the various Source FilmMaker videos I’ve seen on youtube, I proceeded to have fun with this one. 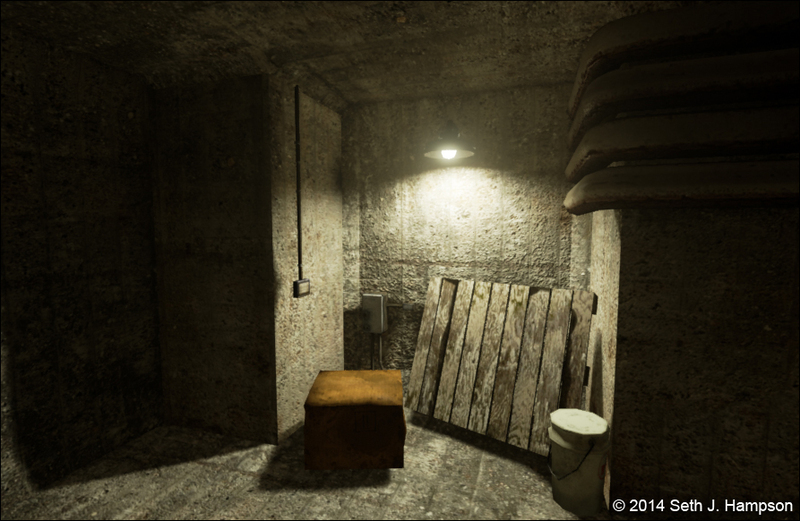 Recently, my brother purchased a UE4 subscription and has allowed me to use it. I love it. Not to put Unity down, but I believe UE4 has many more useful features from the get-go, and is significantly cheaper than Unity. The only downside is that you need to know C++, but that isn’t too much of a problem. 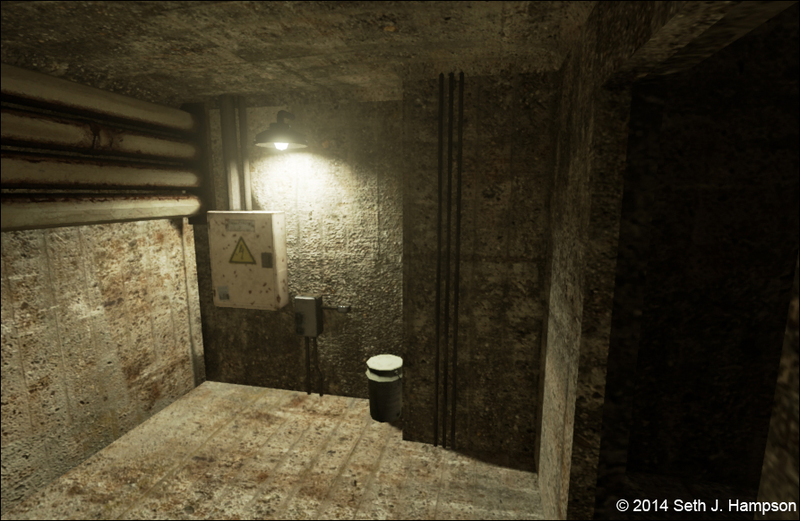 It has been announced that Unreal’s developer Epic games are planning to help fund Blender’s FBX export features. Better export tools will streamline the blender to UE4 workflow, making it much more friendly for artists who can’t afford Maya or Max. 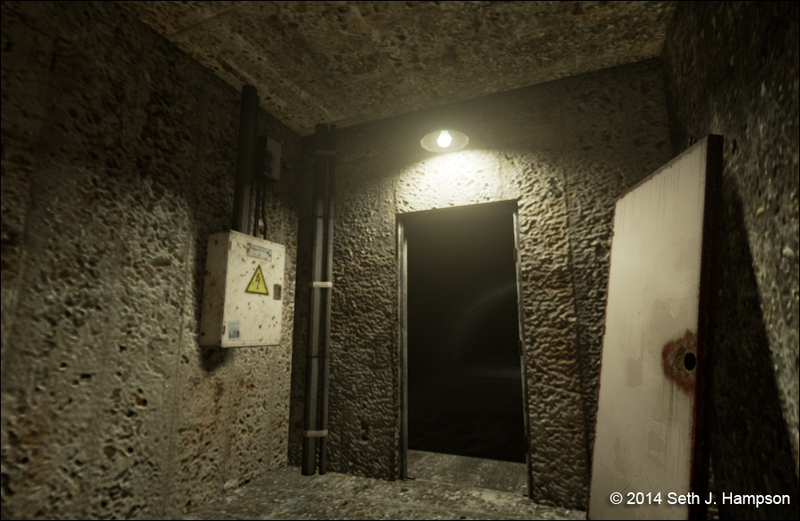 Because of the benefits, I’ve decided to switch Sachtberg from Unity to UE4. Only a few days, and I’ve already made substantial progress in blocking out a level. 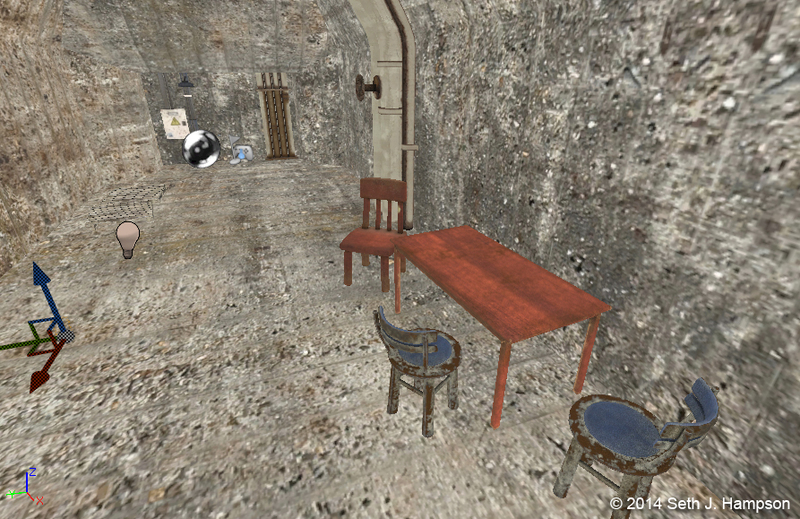 Everything modeled in Blender, and textures made with Photoshop and dDo. I’ve been working on my character for too long it seems. I’m getting sick of working on this and I need to take a break but I don’t really feel like getting in to anything else. I also don’t want to forget to finish the character so it’s quite the dilemma. 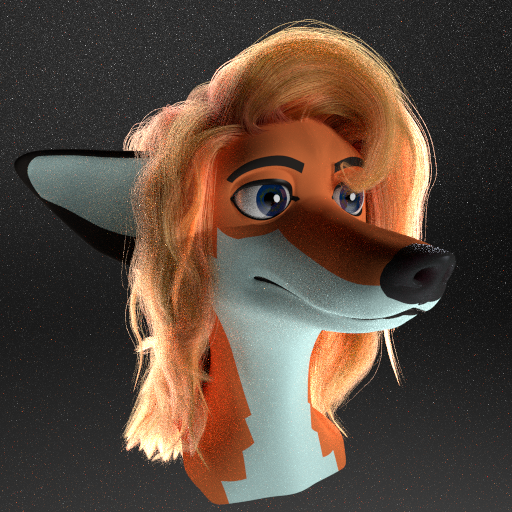 I spent a lot of time learning how to make hair in Blender Cycles. My second attempt yields better results, but the color is flat and boring. It is a good start, however. 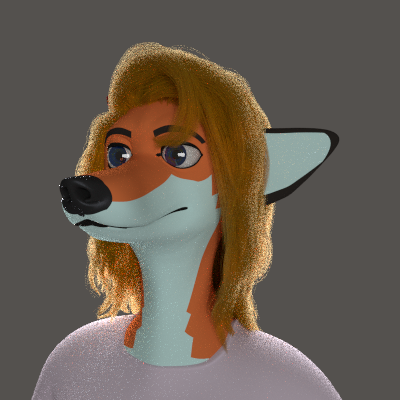 To add variety, I added a texture that defines subtle differences in color for each hair, a color-ramp that makes the hairs get more “orange” at the roots to match the fur color, and a mixer to brighten and intensify the highlights. There was something about the hair around where the “widow’s peak” would be that bothered me, and the frizzy hairs along the side were too uniform. After a lot of tweaking, researching, and obnoxiously long render times, I finally get something I’m pleased with. I have the displeasure of having lower-end computers to work with. 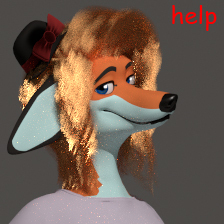 I could either have a 12 hour render time, or have her look like she’s in the sparkle-verse. I can’t afford a $1500+ rig. Next step is to do the fur. Considering how long it took to render the scalp-hair, I’m not too excited for this part. 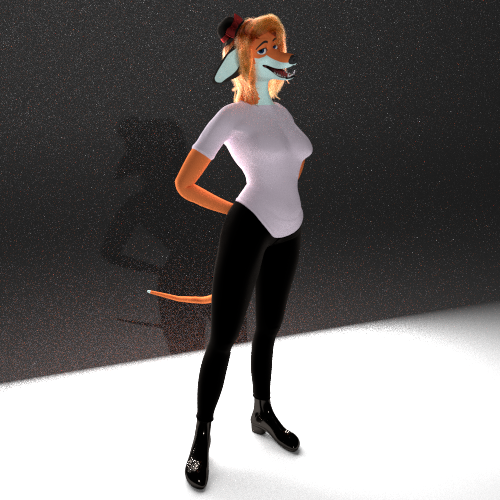 If you’re wondering why her tail is just a “stick” in the last image, it’s because I’m preparing it for the fur layer. Can I take a break? I want to do some digital paintings of things that aren’t characters. We’ll see about that.